The free Coolutils Photo Viewer is the best way to transfer photos from a camera to the hard drive. Preview images, delete bad shots, organize the good ones, give new descriptive names - all done in just a few clicks! Enjoy thumbnails of any size you choose or go to full screen mode. 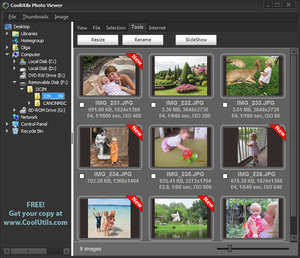 Coolutils Photo Viewer supports all popular image formats (JPEG, TIFF, BMP, JPEG 2000, GIF, PNG, PCX, WMF, ICO, TGA, RAW). For security reasons, you should also check out the Coolutils Photo Viewer download at LO4D.com which includes virus and malware tests. Additional screenshots of this application download may be available, too.